Bio: The Destrons are a foul group of criminals and convicts that also happens to be one of the most elite strike teams in the galaxy. 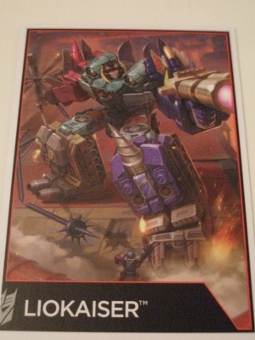 Together, they become Liokaiser, a Combiner whose sheer power is rivaled only by his penchant for evil. 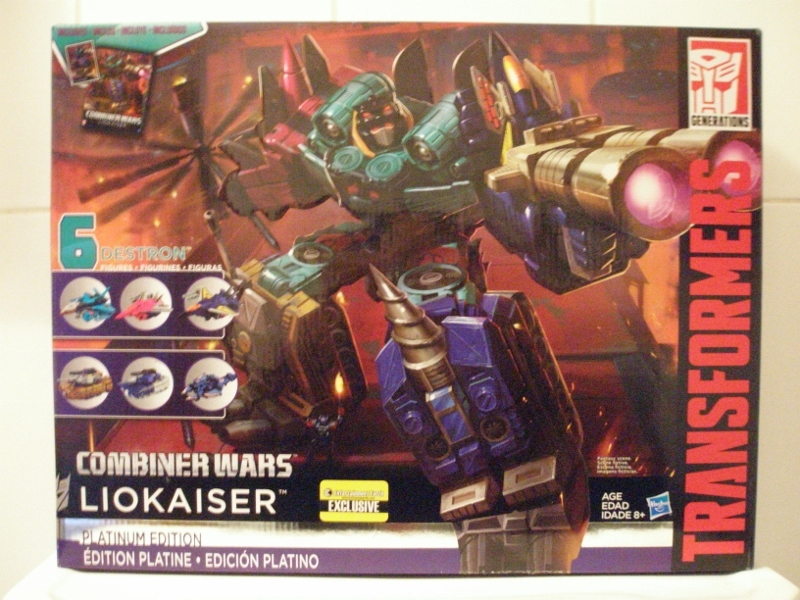 Of all the Combiner Wars toys, Liokaiser was the one I was super-excited about, following the release of some grainy artwork to the internet. I liked the look of the fancy looking Japanese figures from way back when, with their little transforming chest plates (which gave them the risable name Breastforce) and chunky designs. They had a decent showing in Victory and were an occasional pipe dream to own - if I ever had a spare grand lying about and took temporary leave of my senses to spend that kind of money on toys. Also for bragging rights, as secretly, most collectors like having an expensive curio they can show off about and I'd be no exception. I did at least get to sample some of the team members as four of the six original toys were repurposed as the Autobot Rescue Force in 1992. They stripped out the partners and threw in new accessories, along with some horrible colours and bizarre 'hazard tape' sticker decals. 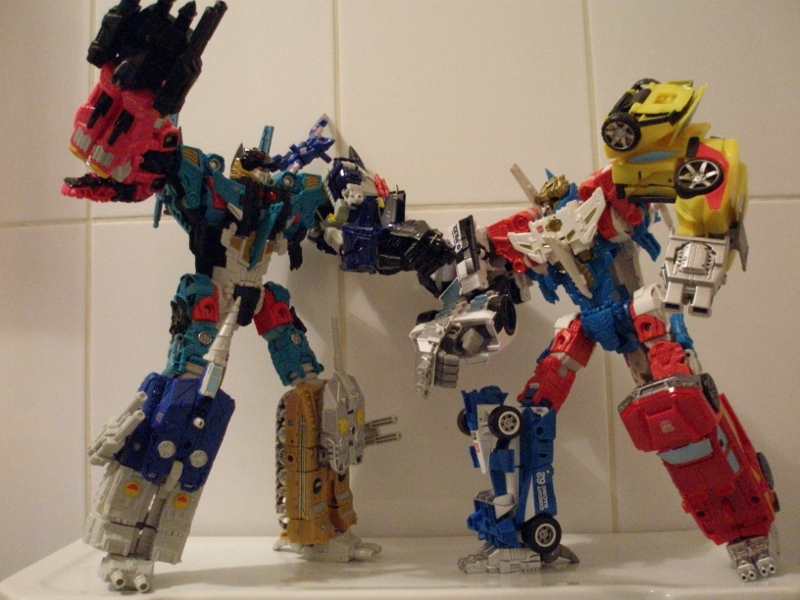 So that sort of scratched an itch � and made me very aware how basic the toys were, and that maybe the originals weren't all that great after all (they're not really � it's the cute little transforming partners and the combining ability that makes them). Anyway, the Combiner Wars box set duly arrived as an Entertainment Earth (who they?) exclusive that originally came packed with a diorama of the Ark (because... Destrons) which is okay, but only a moderate improvement over that S.T.A.R.S. Thing (I wasn't a super-keen pre-orderer, so don't have this). My enthusiasm had cooled somewhat by the time I did pick these up, because, well, it's Combiner Wars and the seemingly never-ending mould reuse rather takes the edge off the excitement as you know what you're getting. 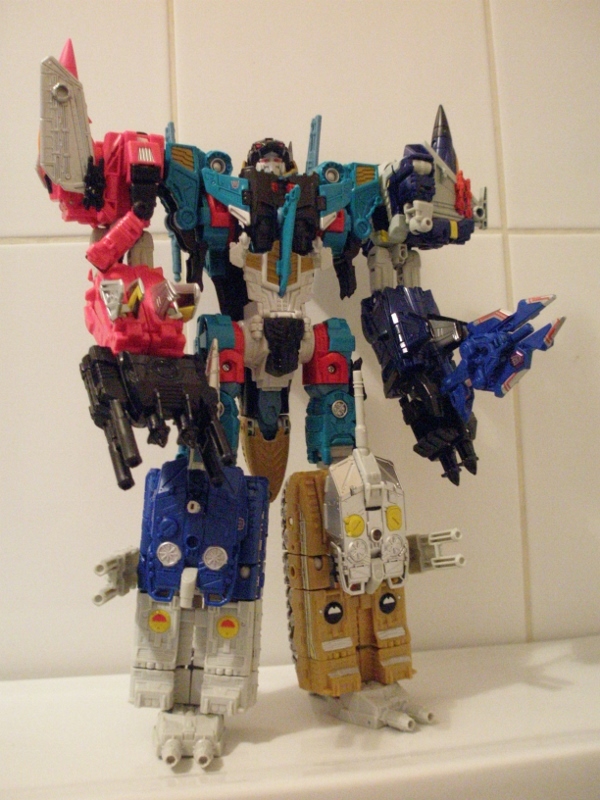 Dezarus Robot Mode: Pinch-hitting for Leozack and Jallguar is Dezarus � previously the commander of the Breastforce Destrons � a repaint and minor retool of the Combiner Wars Sky Lynx mould (he's got a fin on his head and they painted the eyes upside down to make him look evil). He's pretty nice looking overall and does a good job of invoking the original's angry chicken alternate mode, despite the toy very obviously being intended for someone else. I like the gold and black worked in, but could have done without the horribly clashing teal and red � why not stick to Dezarus' original colour palette? He can wiggle his legs about, but as with Sky Lynx, his posing power is nixed by the feeble feet, which can't really support the weight of the robot mode (impressive, given that he's hollow). Dezarus Alternate Mode: Shuttle mode is great and fun to swoosh about the place. Not really a right lot else to say about this that hasn't been said about Sky Lynx. It's detailed and nice looking in general terms, but the colours spoil it. 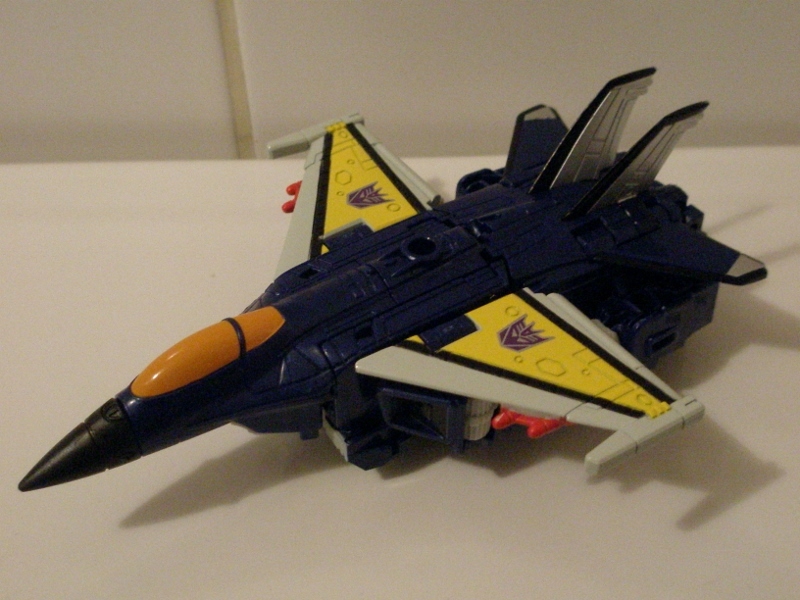 Fellbat Robot Mode: This poor sod has the unfortunate CW Skydive mould to work with. So I'm pleased that it actually looks pretty marvelous here, done up in a deep blue with a new bat-like head. Whereas Skydive looked podgy and uncomfortable, Fellbat looks sleek and ready to rumble. Amazing what a suitable head and a different dollop of colour does. He's perhaps a bit plain looking being mostly blue with some grey bits, but it's what he looks like, so what can you do? 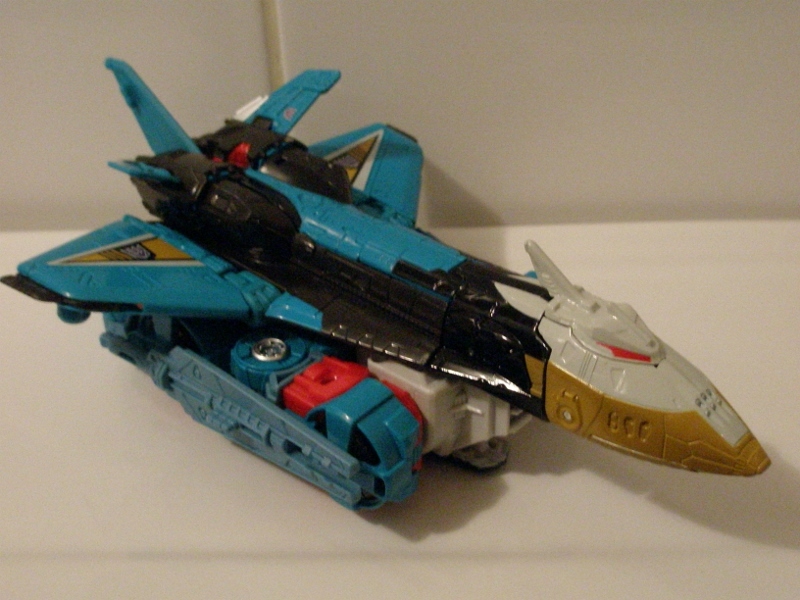 Fellbat Alternate Mode: Jet mode brings some nicely tarted up wings to the sea of blue to keep things interesting. As with all the CW jets, its a bit on the podgy side with all the robo-junk going on underneath, but otherwise the blue and grey works very nicely. Guyhawk Robot Mode: Jesus, this guy is awful. This is where 'cartoon accuracy' can do one. I can just about get past the horrible mix of bright pink and black (really doesn't work and looks worse in hand than the pictures show), but not that retched peanut head. It is literally the size and shape of a peanut. In pink. With mad looking goggle eyes. Its so bad it distracts from everything else. Look at it! It's horrible! Whyyyyy? It doesn't even look, y'know, hawk-like, which I thought was the point. 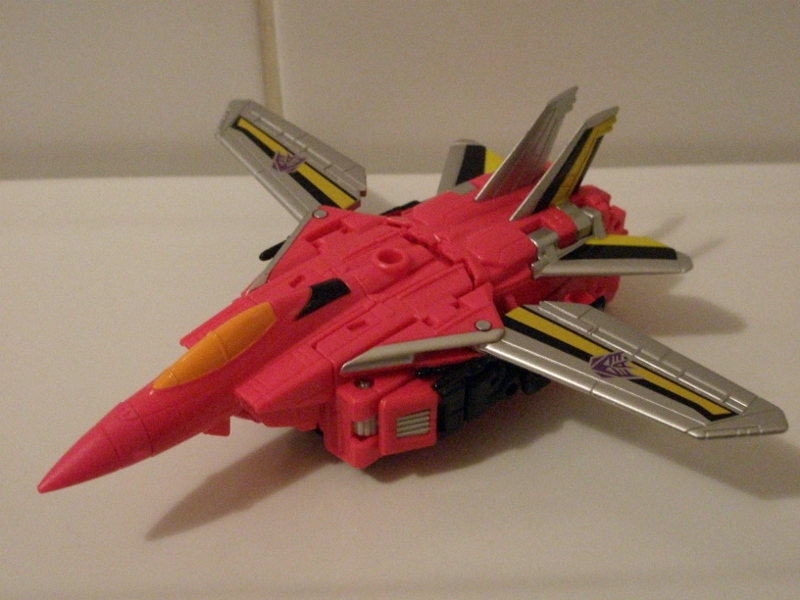 Guyhawk Alternate Mode: Daft as his robot mode is, the alt mode is at least pretty good - bringing hot pink death from above. It looks daft, but gloriously so. 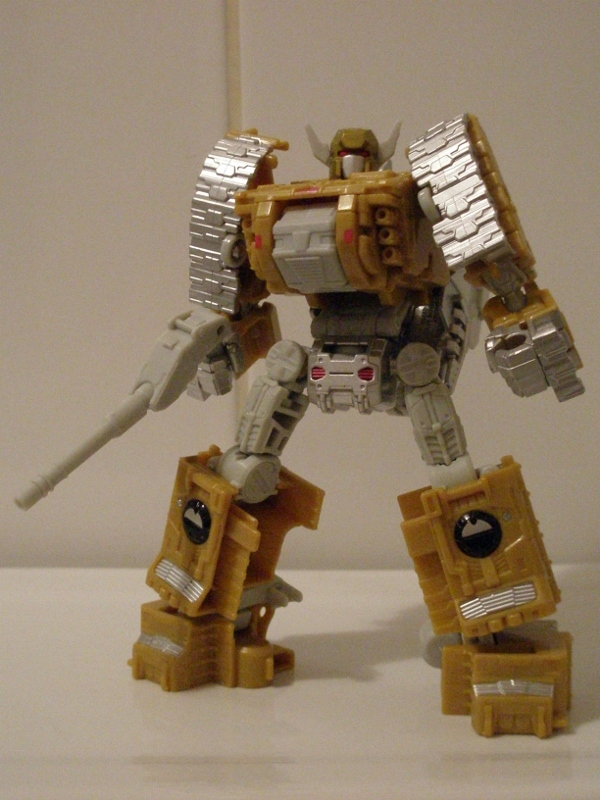 Shame the silver didn't carry over to the robot mode. Would have worked wonders. 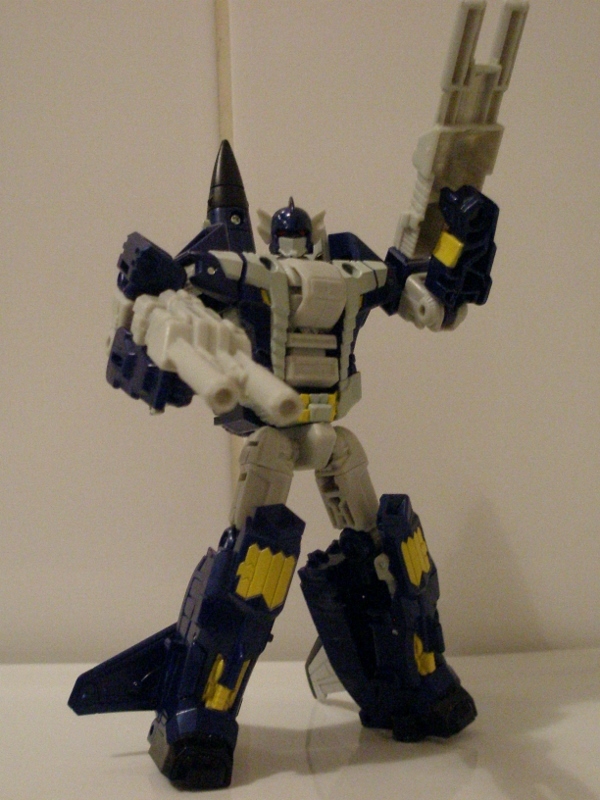 Killbison and Drillhorn Robot Mode: The two tank chaps bring a bit of class. Yes, its the Brawl mould, so waist blah blah blah, but the heads are much more in proportion with the body, so look actually tough and threatening. Well, as tough and threatening as a gold tank fella and a blue dude with a horn sticking out the middle of his head can. As with Fellbat, it's the new heads that make these guys. They look great. Killbison is easily my favourite, with his big tuning forks and beady red eyes. I like that they have matching outfits too � all grey jogging bottoms and Adidas sportswear tops. 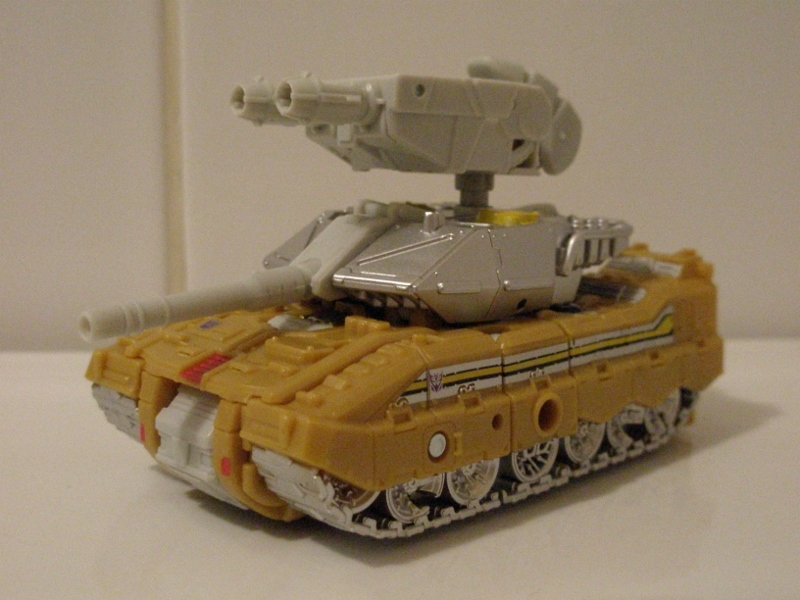 Killbison and Drillhorn Alternate Mode: Drillhorn was my first go on the 'backwards tank' thing used for CW Nosecone, and I can't say it looks much good, so I just use the standard tank mode and plug the drill bit where the tank barrel usually goes. Killbison is a big gold tank. How can you not love that? It's like something a ridiculous African dictator of some state no-one knows or cares much about would own, having splashed out on some further ostentatious purchase, spaffing away aid money meant for his people and ill-gotten gains from some western mining company or other. 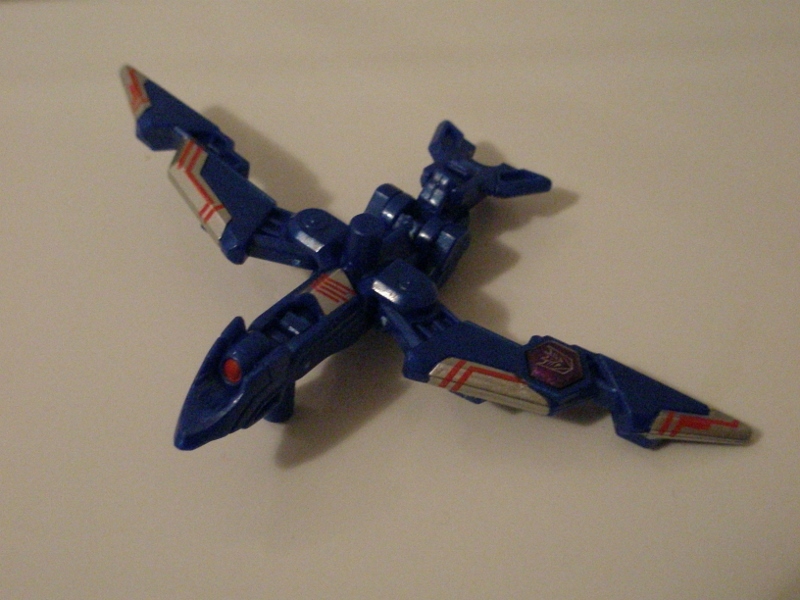 Ion Scythe Alternate Mode: Doesn't turn into a scythe. Bit disappointing. I think its supposed to be a dagger or something. Whatever it is, it looks piddly held in Liokaiser's clumsy mitts. 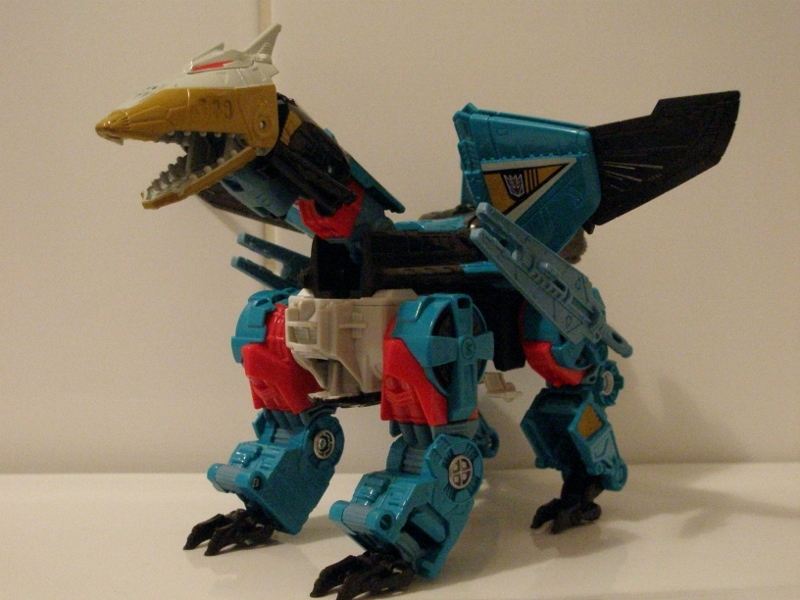 Liokaiser Robot Mode: Liokaiser's robot mode is a lanky and slightly clumsy looking affair. It just about works, but it's so incredibly wibbly. The looseness of the moulds � through endless re-use and cheaper manufacturing processes � really harms the gestalt. He's great to look at, but just don't touch him. The colours work surprisingly well together - even Dezarus' horribly clashing palette � and the overall look is good. Liokaiser's head being jammed up inside the lynx head is a nice touch, and the right hand just being a mess of guns is a ace. 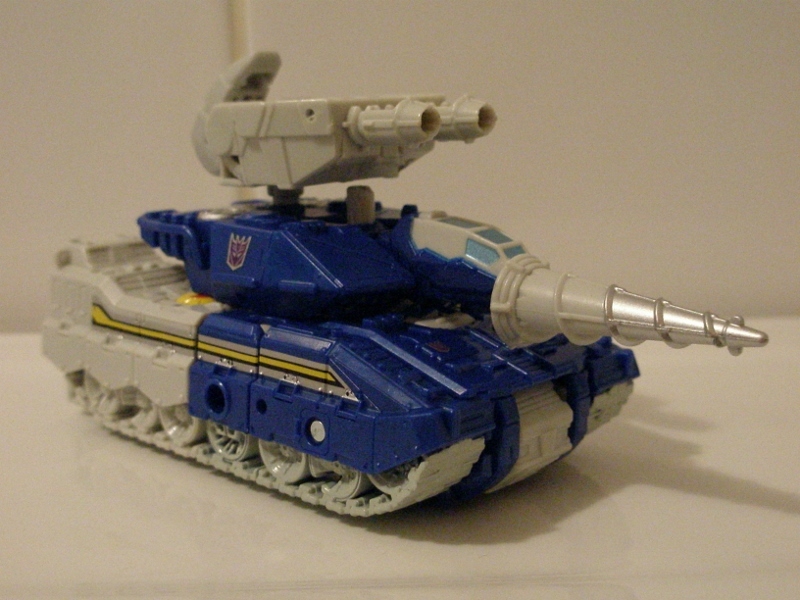 Elsewhere, its just standard Combiner Wars stuff � the tanks make for stable legs and the jets make for decent arms. Its good, but not enough to make it particularly special. 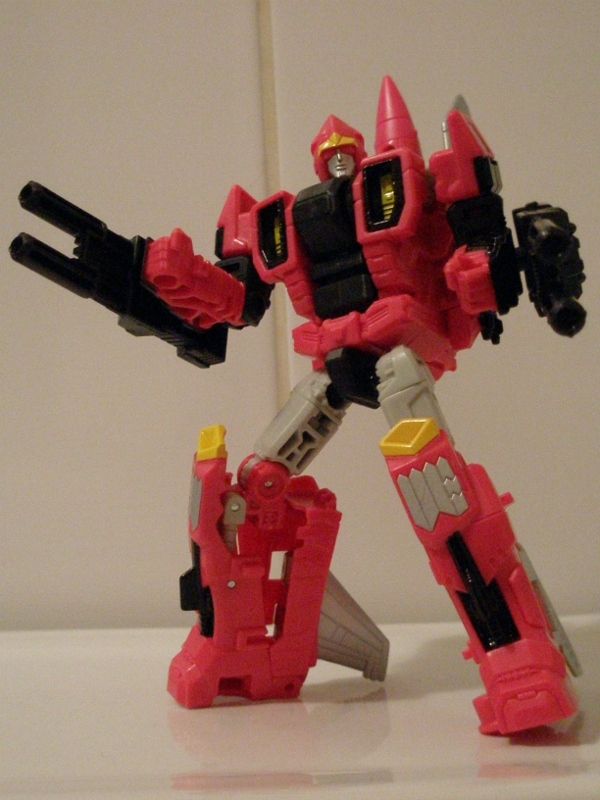 Which is a bit of a shame for a flashy exclusive toy � there's not even those awesome hands and feet Computron has. As previously mentioned, Ion Scythe is a bit superfluous to requirements and doesn't add much to a guy whose entire right hand is a pile of guns. Coupled with the wibbly plastics � worst of which is the heel spur on Killbison, which is notably droopy, Liokaiser feels a lot less of an event than he should be.